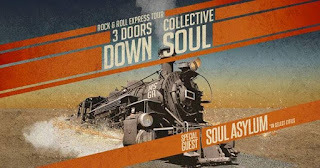 3 Doors Down and Collective Soul are inviting fans aboard The Rock & Roll Express Tour this summer with special guest Soul Asylum on select dates. Produced by Live Nation, the amphitheater outing will kick off July 6 in Atlanta, GA and travel to 36 cities across North America before wrapping September 16 in Phoenix, AZ. 3 Doors Down will be bringing the "On-Stage VIP Rock & Roll Express Viewing Platform" to a city near you this summer. This package offers VIP On-Stage Viewing From the Rock & Roll Express Deck, situated on stage for their entire set along with meeting the band, premium ticket for Collective Soul’s set and much more. All VIP packages will be available starting Tuesday, March 27th at 10am local time. More information can be found at www.3doorsdown.com. 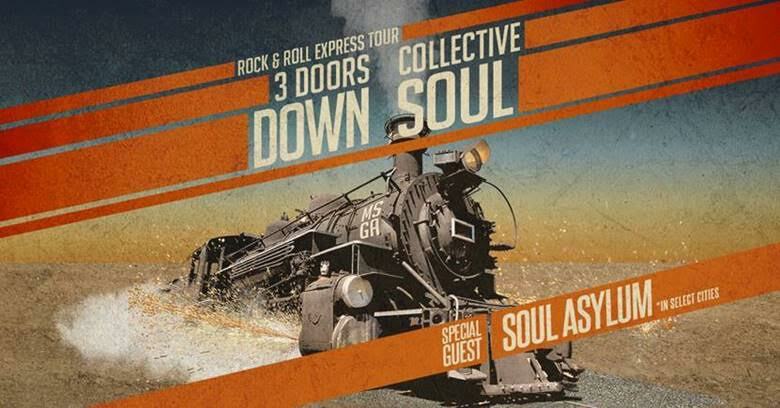 3 Doors Down’s Brad Arnold shares, "Soul Asylum, Collective Soul and 3 Doors Down, That’s’ a big night of hits! I’m looking forward to hopping on the Rock & Roll Express this summer. It’s gonna be fun!" Collective Soul’s Ed Roland adds, "It's going to be an exciting summer! Not only are we going to be out with a great band, but also some great friends. I look forward to seeing everyone come out and rock with us, 3 Doors Down, and Soul Asylum."